So let’s have a conversation about it. [6:15]JezC – for archivists the question is ‘how do we catalogue/archive the richness of our culture’? JezC – my mate’s a bootlegger, with an archive of over 20 years, that has no commercial viability, but can’t do anything to make it available. It’s part of folklore, history, culture… But we can’t do anything with it. Another guy who has hundreds of demos from very early in certain famous bands’ careers that he wants to make available as culture, but there’s no mechanism for it. Q: What’s the scope of this? With the ease of publishing to the web, are we going to be capturing and publishing works that fall out of copyright, rather than recording ourselves playing songs on guitar? A: dubber: we’re not making a website for it, we’re collecting the voices together that say this is culturally important. Comment: parallels with the pharmaceutical research, with limited copyright controls based on the ‘public good’ of making it available after 5/7/10 years… There’s no good reason for the 90 year copyright law. (this makes me want to put my back catalogue on BitTorrent – more on that later. Dubber: The first discussion to be has is about the reason for copright – firstly for the friends of royalty to monopolise the monetizing of culture, and secondly to encourage creativity. do we need to incentivise creativity now? Was Hooky right when he said ‘people will stop playing music if they can’t make money’. I don’t want this to be all about copyright. This discussion is about pop music not just about being for sale, it’s culture, we all own it culturally. We sing the songs. [6:29] who decides the value? the artist or society? Dubber: it’s up to government to legislate. But at the moment, it’s at the lobbyist level. We need lobbyists for culture. JezC : why is music unique in having to have these discussions. We don’t pay £300 to see a Van Gogh. Comment (Lee P): who owns the copyright? how long for? I’d make more if I owned it myself, rather than if there were labels/publishers inside. If the artists made it for themselves for a short time, the encouragement is to keep creating. Q: Are there 2 aims, archive, and making music free? JezC – not for me, it’s one thing that’s bigger than that. It’s about preservation, so that it’s still there in 300 years time. A voice at policy level, to advocate for culture. Dubber: there are lots of threads, but the crux is simple ‘music as culture’ and all that that means. The archival thoughts are about clarity – most of the time we don’t know what we can do, and we have to assume we don’t have permission. That shuts down culture. Comment – archiving for review is a much easier ‘sell’ than archiving for re-use. Dubber: I want to get everyone else to get excited about this, to inspire with the idea and let someone run with it. I’m writing the book about Deleting Music, people in the industry get scared that it’s the opposite of making money, but music treated as culture makes way more money. Online, we need to acknowledge it as important, and we’ll have a better shot at it. [6:35] does ‘world’ music archive and release come under this? Dubber: Smithsonian, Lomax etc. do it as exotica, but culture is also right here. Everybody has culture. That’s been missed. Q: is the archiving a moral abuse of the artists in developing cultures that are being recorded and released? Dubber: yes, but the fact that it’s happening is preservative. Dubber: the labels will argue they can’t make money from it. The issue is with copyright holders doing it. JezC: we are starting the discussions, pushing for change. At the moment there’s nowhere official for the discussion. That’s the point of the project. Dubber: When you mandate that the record labels use it or lose it, they are probably going to make surprising amounts from some of it. If they’ve got 5 years to make money or make it public domain, it’ll incentivise record company ingenuity. Like the VCR scaring film industry, but becoming their major vehicle. JezC: our thought was the artists don’t create to make money, that comes later. Jon: Comment: 2 battles to fight. one at policy level, one popular level. Do you need a patron or a champion that the public can hang it on? What are the dangers of putting that weight on one person? [6:44] comment: would help to remove the ambiguity around remix/reuse licensing. The ‘norm’ is to pay for everything, now it’s a lot more open with Creative Commons, though still not the norm. Dubber: the media environment has changed, we have to throw out all the laws we’ve got around this, and rewrite. It’s being done in NZ, a total rewrite of copyright law. There’s an EFF equiv. but not from a cultural perspective. If that discussion happens here in the UK, we need to have a voice. It’s not just stopping people from listening to music without paying. Q: what if rolling copyright disenfranchises someone from music that suddenly starts making money years later? Dubber: that needs to be discussed, certainly, but it is culturally the exception..
Dr Nick: the MEPs promoted and opposed it, and copyright goes beyond music. There are dinosaur bones in private collections that no-one’s seen. Same for historic manuscripts. Private ownership prevents cultural exploration. Same goes for private ownership of master tapes. I’m not saying you take them away, but a process for archiving and intellectual enquiry. 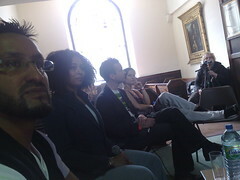 JezC: The impression from this morning’s panel was about the passion of creating music and culture. That’s what drives us. Q: Should the public purse be used to buy artifacts? Q: does this need to be an internationally standardised concept? dubber: it’s hard to solve internationally. Policy is part of culture. Part of what we do as people is expressed through policy, the best we can do is get it right and provide an example. PennyDist: is the model to form regional groups? is that a problem? Dubber/JezC “No!” we’re just writing the doc, locality is part of our culture. Brum Music Archive is a big part of that. JezC: The Beat Goes On exhibition in Liverpool is a great example – it’s city-level, academically supported, but scuppered by copyright concerns. So much confusion about what constitutes culture. We just need to start the discussion, take that first step to change the climate. Dubber: this is not just about solving problems. One thing we’ve done is BrumMusicMonth – we declared June BrumMusicMonth. That’s it! the whole conversation. 🙂 It’s like a hashtag – apply it to anything. Anything that happens around Brum music can have it applied to it. No ownership, just about celebrating from Brum. What’s interesting is it’s inspired creation. One In Ten masters are available for remix. There’s a free album in the works of versions of it. There are plans to have new brum bands cover classic brum bands. there’s a brum youtube classic on the site every day. JezC: it’s about celebrating the culture of the city. Dubber: some people just didn’t get it, didn’t get that it was just a celebration of culture. It’s not about promoting anthing, just a celebration. Suddenly, opinions changed. Visual artists get a similar thing to the multi-national music industry set-up from the old fashioned gallery system. The larger galleries choose and then show our work and if that wasn’t tough enough, then more of the same from the self-appointed art critic who then decides what is culturally-relevant and what isn’t.